I had the most amazing weekend of adventures outside of the South Bay bubble that was topped off with a fabulous surprise trip to the real life ‘Father of the Bride’ house. After a fabulous afternoon at the Rose Bowl Flea Market in Pasadena (post to follow), my friend realized that the area near the flea market is chock-full of famous houses from TV shows and movies, so we packed up our flea market finds and made the short mecca to San Marino to visit the picture-perfect neighborhood where one of the most famous wedding movies was filmed (at least partially). Check out this beautiful street! 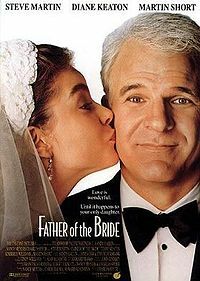 No matter how many times I’ve seen it, the 1991 Steve Martin remake of the 1950s Elizabeth Taylor film is still one of my favorites. Surprisingly, I don’t own it- but you really don’t have to, it’s on TV all the time these days. This house is located at 843 South El Molino Ave and looks just the same as it did more than 20 years ago. 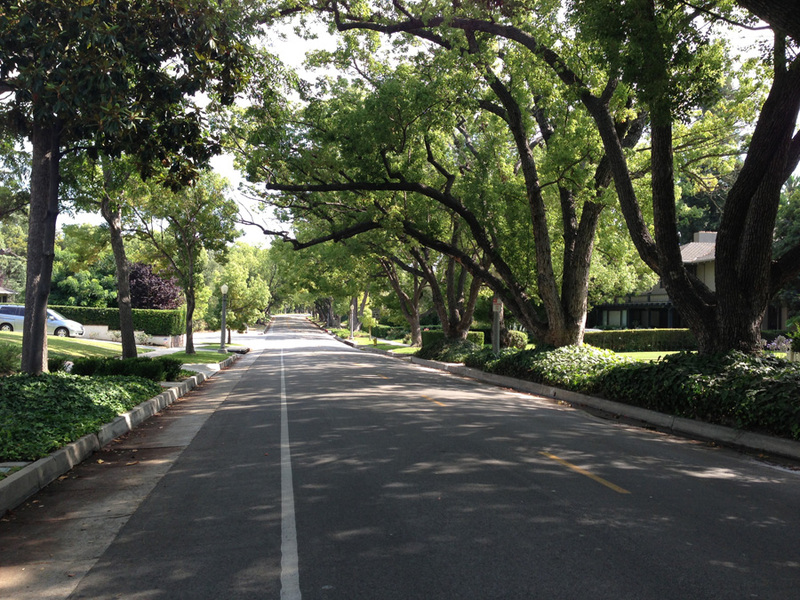 The entire area with its picture perfect tree-lined streets and well tended yards made me homesick for the midwest! The houses are big and beautiful and have the most amazing porches… something that I long for every weekend morning when I’m sitting inside drinking my coffee looking at the beautiful California weather. A couple other famous houses are located in the area too like Doc Brown’s house from Back to the Future, Jenna Rink’s (played by Jennifer Garner) house from 13 Going on 30 is at 1965 Fletcher Ave, and the original Halloween home from the Michael Myers is only a couple miles away from the Bank’s household at 1000 Mission Street! I always feel funny going to off-tour movie locations, but it’s also kind of exciting at the same time. It feels slightly intrusive, but it’s not like we’re going to stand in front of the house and get shot by the homeowners. Plus, they bought the house knowing the history and knew about the possibility of movie stalkers… but I’ll bet at times they wish they could shoo us off their street with a couple rounds of high-powered ammunition. I checked out the #fatherofthebride hashtag on Instagram and saw some pretty rude tourists literally standing on their front yard and getting their pictures taken. I felt better about our drive-by viewing after that, because we stayed safely on the street away from their property. Please keep in mind- When touring filming locations, do not enter the property, ring door bells or disturb the inhabitants in any way! It was weird to see their home in real life, but for me it made the movie that much better knowing that it actually exists. Matty Banks: Can I put Cameron back on the list if he promises not to eat? George: You know, that’s not a bad idea. Who else can we ask not to eat? My parents and your mother. Annie: Why don’t we just charge people? That way we can make money on the wedding? Unfortunately, the new owners took down the basketball court George and Annie played at in the movie- and the snow from the fluke wedding snow storm was also gone. 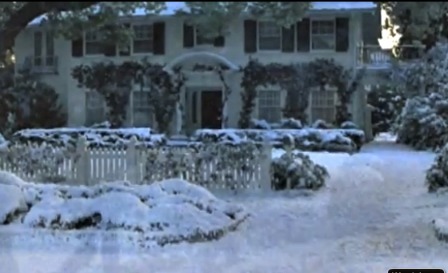 (Actually… I don’t think it’s ever actually snowed like that in Pasadena, but it’s a cute story line!) Apparently they actually filmed the wedding parking debacle at this location as well. George: I’ll tell you what I’m doing. I want to buy eight hot dogs and eight hot dog buns to go with them. But no one sells eight hot dog buns. They only sell twelve hot dog buns. So I end up paying for four buns I don’t need. So I am removing the superfluous buns. Yeah. And you want to know why? Because some big-shot over at the wiener company got together with some big-shot over at the bun company and decided to rip off the American public. Because they think the American public is a bunch of trusting nit-wits who will pay for everything they don’t need rather than make a stink. Well they’re not ripping of this nitwit anymore because I’m not paying for one more thing I don’t need. George Banks is saying NO! 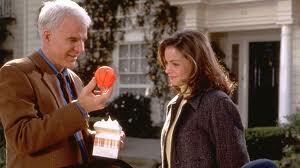 Stock Boy: Who’s George Banks? An extra fun fact is that just down the street (they’re literally neighbors) is where AMC filmed Donald Draper (played by John Hamm) and Betty’s (played by January Jones) house for the TV Show Mad Men. They’re supposed to be in Ossining, New York but I guess 675 Arden Road in Pasadena, California looks just the same… except for the red door of course. Pasadena California- home of all the homes you’ve ever longed to live in from TV shows and movies.